Another week has come and gone and I’ve reaped many blessings from another conference. The conference this week was held in the most remote village I’ve stayed in Kenya thus far. I’m once again settled into a little hotel room and have had a wonderful shower and am thankful once again for a toilet. Last week being the first trip was what I thought would be the most difficult. I really hadn’t had much time to adjust from being home in the states before I arrived out in the bush. Throughout those first days I prayed often for the Lord to help me through. I reached a point in my prayer time that I told the Lord that I knew I was right where He wanted me to be and I was planning on continuing His task He’d given me to do….but I ask Him if He could somehow make it not so hard. Adjusting to no running water or toilet is just plan hard especially since it is a drought here…hot, dry and dusty. When I first arrived at our destination for this week’s conference, I had to make some other adjustments. Never having traveled to any of these remote areas, and not knowing what to expect… I try to mentally prepare myself for the days ahead that I know will not be easy for me with the living conditions as they are. Yet, there are some things that are simply just not easily adjustable. I was carried to the hut where I would be staying and the odor from within met me before I walked through the door. 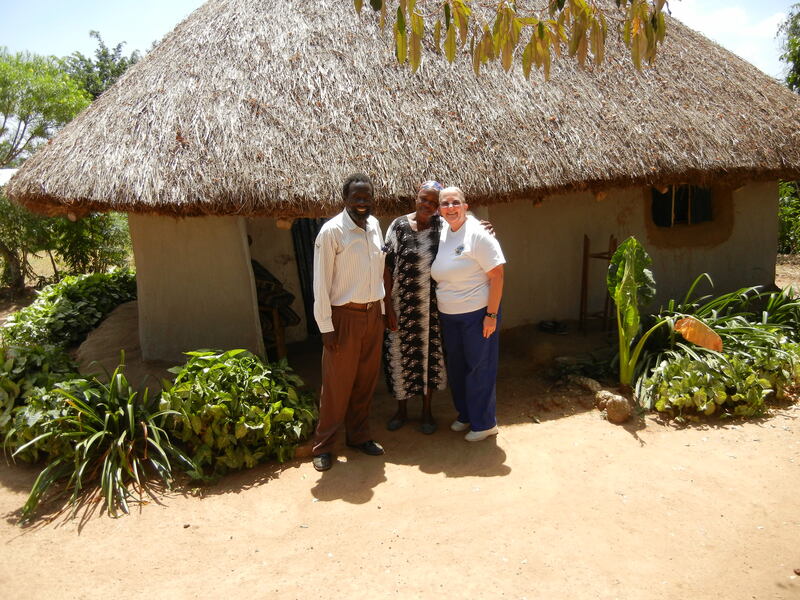 I stepped inside the hut and kept a smile on my face while I was being shown around…but I was genuinely crying out to the Lord…telling Him….I can’t do this…You must do this through me….because everything within me is screaming run out of this place….tell these people I’ve made a mistake…I can’t stay here. We were only inside the hut for a short time before heading across the road to the church to teach my first class. Throughout the day I kept thinking about what lay ahead for me when dark came. I knew I was going to have to overcome the odors and do my best to adjust. When I arrived back in the hut and was alone, I began to seek out what smelled so bad. The closer I got to the bed, the worse the odor became and my heart was sinking. Only the bed had a mosquito net and I had no choice but to get under it for cover for the night. The mattress on the cot for me to sleep on smelled, but not as badly as the blanket they’d given me to sleep under did. I always bring sheets with me but because its always so hot, I didn’t think about bringing a blanket. Apparently the climate is different in this region and it gets normal hot during the day but about midnight coolness sets in and then it gets cold. After I finally fell asleep I woke up trembling from the coldness around me, yet I could not make myself get that blanket and wrap it around me. I knew I was better off cold than vomiting from the odor of the blanket. It was a long night and I was thankful to hear the roosters begin to crow…I knew daylight was around the corner. Tom who is like a son to me here in Africa is traveling with me to these conferences. Before we left to go to the church I saw a chicken walk into my hut. I told Tom we needed to get the chicken out and his answer shocked me. He said, Mum, we can’t get it out…its nest is in there… didn’t you know it was in there last night? He then took me and showed me that at the end of my cot was a pot that had been made a nest for this hen and the eggs she was hatching. All I could do was laugh! I had gone to bed with a chicken not one foot below my feet and didn’t even know it. So, I decided that God had done me a favor by not letting me know that chicken was there that first night. I don’t think I could have held it together if I had known. Then it struck me….I was going to have to go to bed that night and every night there after while I was there with that chicken in its nest right below my cot. Not wanting to offend my host….I kept quiet and once again went to bed that night miserable. Another long cold night came and went. Do you know what surprised me….that chicken didn’t make the first sound. That’s why I hadn’t heard it that first night. I began to think about how God creates His creatures to behave exactly as He created them. That chicken wasn’t worried about me…my being there didn’t stop it from doing what it was suppose to be doing. 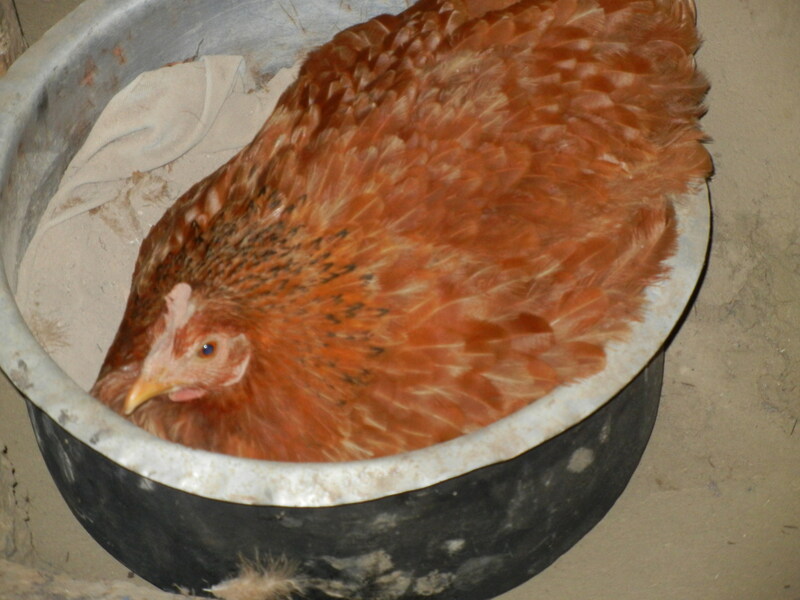 That chicken was going to protect her eggs no matter what the circumstances around her. I began to understand the lesson God was teaching me. If He could create a chicken who would protect her unhatched eggs no matter the circumstances, how much more was He protecting me….the girl He created as His child regardless of the circumstances surrounding me. The chicken was still there, the blanket and the odor of it and the rest of the hut were still there but I found peace in my surroundings. Later that day I asked to meet the owner of the hut I was staying in. I knew it was one of the church members but I hadn’t been told who they were. This is the family I was introduced to…. a widow woman and her 6 children. They had given up there home for me to have a place to stay. For two days I had been miserable in my surroundings, yet this precious family lived in these surroundings every day and its their home. A home they gladly shared with this spoiled American woman who thought it wasn’t good enough for her! 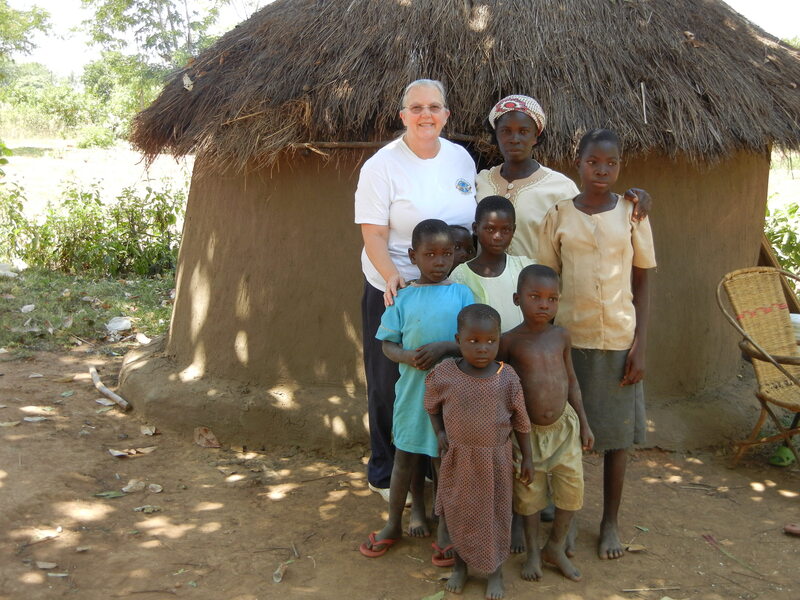 (A word of thanks to everyone who financially supports me….this widow’s hut leaks badly everytime it rains….thank you for supporting me….because of your support WE were able to give her the funds to fix her roof before the rainy season arrives in a few weeks. For the first time in a long time her and her children will have a dry place to live). It seems everytime I think I have reached a place that I have worked on what God needs me to work on, He up and shows me another area where I need help. He continues to strip one layer after another away….yet, I keep holding on tight to Him because I know that with each layer He removes, I move closer to Him. Later in the day Tom traveled 4 hours round trip to get me a blanket and as I laid down that night wrapped in warmness of the clean blanket, I was reminded of a book I read called, “Safely Home”. Its a story about a missionary in China living through years of torture and ultimately leaving this earthly world as a Martyr for Jesus. I lay in my cot…the odors still all around me….the chicken still below my feet…and yet I knew I was blessed. My life was not in danger and I knew that when morning came I would not be persecuted as I walked across the road into the little bush church and taught what God had given me to teach. Although its not easy to be here…I thought about all over this world there are missionaries and persecuted churches in grave danger in much worse surroundings than mine and I knew I needed to pray for them more than I ever have before. As morning came and I walked over to the church and began my lesson, something very special happened. I was in the middle of the lesson and all of sudden I couldn’t remember the point I was making…the words just wouldn’t come. Slowly Holy Spirit took over and I found myself sharing about some of the hardest times in life…things I’ve never shared not even back home to very many people. People here think we Americans are rich and according to the standard of life they live we really are. But they also think we’ve never had problems or hard times. We come into their lives and our outward appearances appear as if we’ve got our lives under control. We tell them about Jesus and that’s what we should be telling them, but I realize now how important it is for us to also share about how God has helped us to overcome our own personal battles. At the conclusion of the session many women leaders, pastors and lay people were admitting their own failures and struggles. Some doubted their salvation. Others had not been able to let of go a past that haunted them and oh how I could relate. It was a very special time for each of us. I know God’s plan for this conference was held in this place because He knew what He needed to do and He trusted me to share. When I think about where I use to be and all God has forgiven me for…how He took a life of brokenness and made me whole….how He saw something in this mess of a women to use for His glory….I simply stand amazed. Years ago Pastor Dave Channell and Brother Vic Smith counseled me and helped me understand that I could let go of my past and embrace who God had always known I could be. Their faith in me and the encouragement they gave me is a vital part of the foundation of who I am today. Later on, Pastor Kevin Ross joined them…choosing to see me as Jesus sees me….he allowed me to serve as a leader…his encouragement and leadership pushed me out of the nest and I began to learn how to fly not hindered by the weight of my past. Last but not least…the Lord brought Pastor David Platt’s sermons via his media department and Secret Church sessions that helped me not just fly but taught me how to soar…..through his teachings I was encouraged to be what God was calling me to be. Not long before I left to serve in Africa full time I was blessed to have Pastor David pray for the journey that lay ahead for me. Once again I heard words of acceptance and encouragement to be All God was calling me to be. I could write on and on of the people who have impacted my life but today I want to honor these 4 men of God who taught me how to accept myself and be all I could be for the glory of God. I thought of all 4 of them as I stood in that little bush church in a remote area of Kenya where more than 200 people were listening. Because these men of God believed in me and spoke truth into my life, Holy Spirit was able to use me to help others reach the place in their spiritual journey where they too are learning to fly and some were even soaring before the conference was over. Are you a mess…is your life full of brokenness? God loves you and accepts you just as you are….brokenness and all. He has a plan for your life….even if you can’t see it just now. He longs to make you whole….and from someone who’s walked that path….turning it all over to Him is something you will never regret. And the view once you’ve learned to soar is nothing like you’ve seen before. It’s been an amazing week here in Kenya. I am settled in comfortably into a small hotel here after spending the past four days completing my first conference here. I am so excited to have a shower and a toilet…even if there is no toilet seat! The hotel has a little restaurant that I have found to be a wonderful place to sit and read. Their food although limited to what I can eat is good and tonight they made fresh passion fruit juice for me..the best I’ve tasted yet! I am just not sure at all if I can express times this week when I felt as if I were in a magical kingdom. A kingdom filled with Christians displaying such a sense of wonder and excitement as I’ve ever seen over learning new things from the bible. I am giving out)…but it has been worth it all as the week has ended and I’ve had time tonight to filter through the week and choose some of the things to share. Each evening I would stop teaching discipleship and teach about whatever movie we were going to watch. We watched the Nativity Story…the story of Ruth and the story of Esther. Most if not all of these people had never seen a movie before and because we had learned what the bible said about what we were watching…it was genuinely more entertaining to watch the people as they watched the movie. I would have to say that being apart of bringing these bible stories to life is just about one of my favorite memories since I came here. They cheered the good scenes and showed genuine concern during the sad parts. I thought about a story Pastor Moses told me not long after I first came to serve in Africa. He said that one night he was showing the movie about Jim Elliott and the other missionaries who were killed with spears. Some of the people who were watching the movie thought it was all real and that they were under attack. Before Moses knew what was happening, spears were thrown into the screen that was showing the movie. Although my experience this week was much different, many times I sat silently in tears as I realized how special it was for God to allow me to be a part of such a tender moment….a moment when the stories came alive and ministered to their hearts. They will never forget learning about Ruth and Naomi, or the wonderful story of Esther….and most of all the story of the birth of our Savior. Yet, there is one more memory from this week that will never leave my mind. I was teaching on eternal security and had spoken of the rapture. At the end of the class time I gave the opportunity for questions… and in the next few moments I knew that if I never served another day as a missionary…this moment would be worth it all. They shared that they didn’t understand completely this thing called rapture and wanted me to explain it to them. This might seem bazaar that at a conference where many are Pastors that such a question would arise. Yet, you have to understand that many of these Pastors, especially the bush pastors who are far away from any major towns don’t have a bible and the ones that do, only have portions of one. Very few have a complete bible of their own. 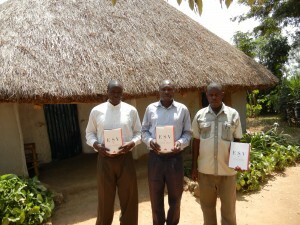 This picture is the first 3 study bibles I gave out this week. The pastor in the middle…Pastor Charles has never had his own bible. Someone in his congregation has one that he gets to use when he preaches….but he’s never had one to sit and read anytime he wanted. Most of these Pastors can only preach sermons they’ve heard preached before….mostly by our teams who have held Pastors conferences for them. What joy filled my heart as I realized that the mighty God I serve had given me the privilege of telling them about the second coming of Christ. To be perfectly honest….I was speechless…and knew I needed to take time to study where I could give accurate scripture references. 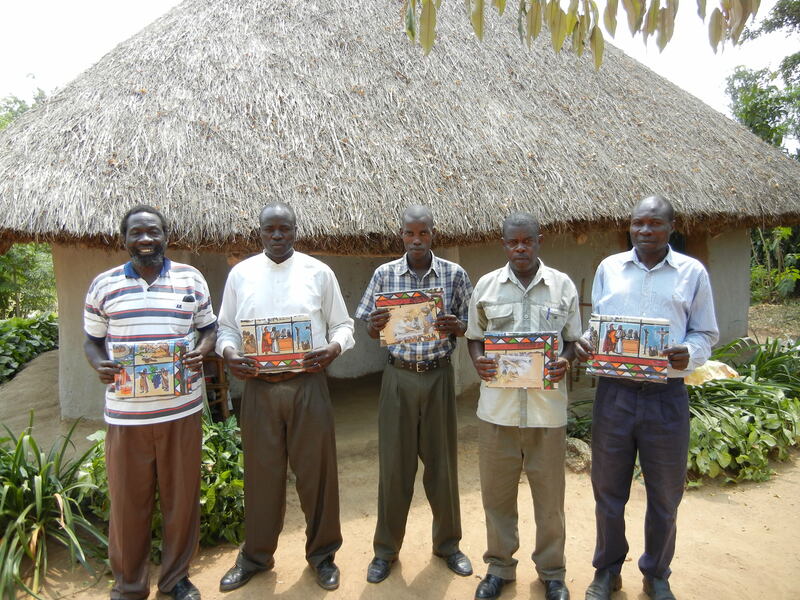 They were thrilled as I promised them that the next day we would study about the rapture. The next morning excitement began to build in all of us as we explored the scriptures referring to the rapture. While I was teaching, a memory from my early years as a Christian crossed my mind. My children and I attended Hebron Baptist Church and for a time on Sunday nights many years ago we would be in church service usually before the message began and one of the young people would yell rapture practice! It was great….I never remember it causing trouble…I remember it being something the whole congregation participated in! Immediately when we heard those words…rapture practice….everyone would jump straight up out of there seats as if we were being rapture right on up to glory! It seemed appropriate that I should share this special memory as we learned about the real rapture that is really coming. I took my interpreter and told him what we were going to do….but nothing could have prepared me for what happened next. When the interpreter and I sat down and then jumped up and yelled rapture practice….the people really understood what we did and the next thing I know people are running all over the building hugging each other and shouting about how wonderful that day is gonna be. I don’t know when we’re going to hear that trumpet….but as excited and memorable as the minutes were….it will not be anything compared to how they will really respond when that day arrives. Oh how I wish we could get this excited in our churches in America! I believe our country would be a much different place if people understood as these bush people did that one day Jesus is coming back for us. and it was there where none of the comforts I wish I had were available… that God revealed Himself in a new an refreshing way to me. I hope this memory stays fresh in my mind because it had been a long time since I’d done my own rapture practicing…since I spent time reading through the scriptures that tells us of that day. The one day of our life here on earth that we as Christians live for…shame on me……. The Life and Mission of Joy Breedlove is powered by	WordPress 3.4.2 and delivered to you in 0.173 seconds using 40 queries.